To benefit the trail and its users, the Friends of the BFRT are assisting with amenities, such as benches and bike racks, and the acquisition of the Phase 3 portion of the railroad right of way (ROW). Also, once constructed, the rail trail will need regular maintenance for which the Friends will provide support and volunteers as appropriate. This picture is from the Charles River Greenway in Newton. To enhance the trail, the Friends of the BFRT are working with towns to add amenities and to beautify the trail. 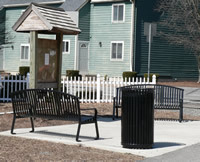 Benches and landscaping will likely be welcome additions in most towns. Some towns may have additional needs for beautification. For example, concrete retaining walls along the trail in Chelmsford could be made more attractive with some murals and landscape design. The Friends of the BFRT have been working with a landscape architect, Jon Diette, of Emanouil Brothers, Inc. in Chelmsford, to develop designs for sections of the trail in Chelmsford. Once reviewed and approved by town, the Friends of the BFRT will fund and help coordinate the effort. Brothers,Inc.for area behind Ginger Ale Plaza. The funds for the amenities and beautification will come from generous people, like you, local businesses, and, where possible, grants. If you would like to contribute, please complete this form or Donate Online. 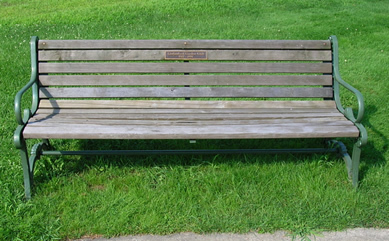 If you would like to contribute a specific item or to have a memorial or honorary plaque included along the trail, please email your request to amenities@brucefreemanrailtrail.org and we will work with you. If you would like to volunteer, please contact us but be patient. We need an approved plan and funds before work can begin. Thank you for your support and generosity. FBFRT is a 501(3)(c). Donations are tax deductible to the extent of the law. Tax ID #20-1889146.